2014 Brammo Empulse R. Picture credits - Brammo. Submit more pictures. The 2014 Empulse embodies many new and improved components making it an EV technology tour de force. Fully 10lbs of weight is removed from the Empulse, further improving performance, handling, and range. With the ground-breaking IET integrated 6-speed transmission, the Empulse is able to translate its 90Nm (66 lb-ft) of electric motor torque to over 880Nm (650 ft-lbs) at the rear wheel*. Carrying capacity: Optional Brammo hard saddle bags and top trunk. 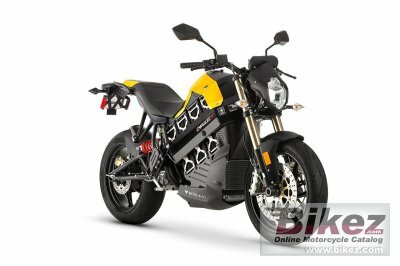 Comments: Brammo Power� BPM15/90 Lithium-Ion ( NCM Chemistry), 103.6 Volt. Recharge time approximately 8 hours. Range: 125 km. Under deceleration, energy is returned to the battery system to both extend driving range and provide familiar rider feedback. Ask questions Join the 14 Brammo Empulse R discussion group or the general Brammo discussion group.